Dr. John L. “Jack” Hayes graduated from Bowling Green University with a bachelor’s degree in mathematics. He earned a Master of Science degree and a Ph.D in meteorolgy from the Naval Postgraduate School in Monterry, CA. From 1970 through 1998 he served in the United States Air Force, starting as a weather forecast officer and eventually rising to the position of Commander of the newly-formed Air Force Weather Agency and Air Force Global Weather Center. Hayes then went to work in private industry as general manager of the $500 million Automated Weather Interactive Processing System program at Litton-PRC. After two years, Hayes joined the NOAA, serving as deputy assistant administrator for NOAA Research, Deputy Assistant Administrator of the National Ocean Service and Director of the Office of Science and Technology at NWS. Hayes then served as director of the World Weather Watch Department at the United Nations’ World Meteorological Organization. 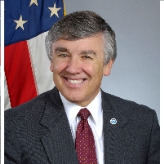 He was appointed to head the National Weather Service in June 2007.